On December 14, 2000, Monkey Day was first celebrated by college students in Lansing, Michigan. On December 14, 2000, Monkey Day was first celebrated by college students in Lansing, Michigan. Today, the day is a chance to celebrate simians of all shapes and sizes. Monkey Day does not just celebrate monkeys—it hopes to bring awareness to all primates. Primates include prosimians, monkeys, and apes. 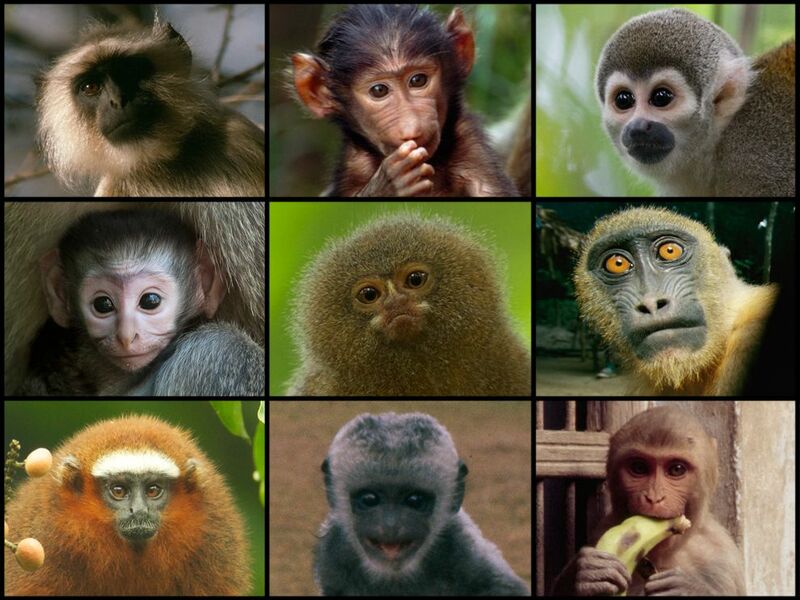 Prosimians are primates that usually have whiskers and extended snouts. Lemurs and bushbabies are prosimians. Monkeys are primates that usually have tails. Some of the world’s most familiar monkeys are baboons and capuchin monkeys. Apes are primates without tails, and with flexible shoulder joints that make it easy for them to swing from tree branches. (Monkeys have a smaller range of motion and usually run along on top of tree branches.) Gorillas, chimpanzees, and orangutans are all apes. Many of the world’s primates are threatened by loss of habitat. Some of the most endangered species of primates are langurs, a type of monkey native to Southeast Asia. Langurs are losing their habitat to agriculture, logging, and housing. mammal considered to be highly intelligent, with four limbs and, usually, a tail. grouping of primates, including lemurs, lorises, and tarsiers. protruding nose and jaw of an animal such as a pig.